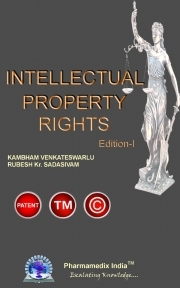 Description of "INTELLECTUAL PROPERTY RIGHTS"
This book is mainly deals with intellectual property rights according to the syllabus of JAWAHARLAL NEHRU TECHNOLOGICAL UNIVERSITY, ANANTAPUR. This book covers almost all the topics according to the syllabus of JNTUA. This book is very easy to study and remembrance. The main topics covered in this book are patenting system in India, regulatory bodies at national level and international level, regulatory affairs. We hope this book is very useful to the all M.Pharmacy students who have Intellectual Property Rights as one of the subject in their course. Reviews of "INTELLECTUAL PROPERTY RIGHTS"